Karimi, S., Talebpour Amiri*, F., Hosseinimehr, S. (2017). Protective effect of Zataria multiflora on hepatotoxicity induced by cisplatin in mice. Research Journal of Pharmacognosy, 4(Supplement), 85-85. Sh. Karimi; F. Talebpour Amiri*; S.J. Hosseinimehr. "Protective effect of Zataria multiflora on hepatotoxicity induced by cisplatin in mice". 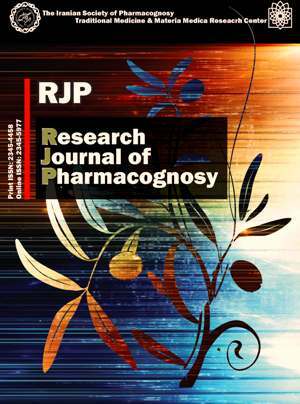 Research Journal of Pharmacognosy, 4, Supplement, 2017, 85-85. Karimi, S., Talebpour Amiri*, F., Hosseinimehr, S. (2017). 'Protective effect of Zataria multiflora on hepatotoxicity induced by cisplatin in mice', Research Journal of Pharmacognosy, 4(Supplement), pp. 85-85. Karimi, S., Talebpour Amiri*, F., Hosseinimehr, S. Protective effect of Zataria multiflora on hepatotoxicity induced by cisplatin in mice. Research Journal of Pharmacognosy, 2017; 4(Supplement): 85-85. 1Department of Anatomy, Faculty of Medicine, Molecular and Cell Biology Research Center, Mazandaran University of Medical Sciences, Sari, Iran. Student Research Committee, Faculty of Medicine, Mazandaran University of Medical Sciences, Sari, Iran. 2Department of Anatomy, Faculty of Medicine, Molecular and Cell Biology Research Center, Mazandaran University of Medical Sciences, Sari, Iran. 3Department of Radiopharmacy, Faculty of Pharmacy, Mazandaran University of Medical Sciences, Sari, Iran. Background and objectives: Cisplatin (CP), the chemotherapy drug, is used for the treatment of many types of cancer but causes hepatotoxicity. Zataria multiﬂora Boiss. (ZM), is a widely used herbal medicine with potent antioxidant properties. This study aimed to assess the protective effect of Zataria multiﬂora against cisplatin-induced hepatotoxicity. Methods: In this experimental study, thirty-two male mice were randomly divided into four groups. The control group; ZM group which received ZM (200 mg/kg) during 7 days by gavage; CP group which received CP (10 mg/kg) intraperitoneally in 5th day of the study and ZM+CP group. Serum parameters such as alanine transaminase (ALT), aspartate transaminase (AST) and alkaline phosphatase (ALP) and also malondialdehyde (MDA), glutathione (GSH) and protein carbonyl (PC) levels in liver tissue of mice, histopathological and immunohistochemical assays were examined to determine hepatotoxicity. Results: CP caused significant (p<0.05) increase in serum AST and ALP, increased oxidative stress (increased of MDA, PC and decreased of GSH) in liver tissues, histological changes (hepatocellular degeneration, necrosis, inflammatory cell infiltration, congestion, sinusoidal dilatation), and increased caspase-3 immunoreactivity. ZM provided a significant (p<0.05) protective effect against cisplatin-induced hepatotoxicity. Conclusion: The hepatoprotective effects of ZM could be due to the antioxidant, anti-inflammatory and free radical scavenging activities.